Summer signing Brad Inman has yet to make his Posh full debut. Brad Inman could be closing in on a long-awaited full first-team debut for Peterborough United. The 25 year-old midfielder, a summer signing from Crewe, has seen just 66 minutes of action mainly due to breaking his leg during pre-season training. He’s played just 11 minutes in League One. On-loan Martin Samuelsen is fighting for a Posh starting place. Inman has sat patiently on the substitutes’ bench in recent weeks. He hasn’t come on in any of the last six League One matches even though Posh have been struggling for form. 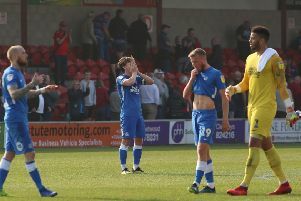 But Posh boss Grant McCann, speaking before Tuesday’s disappointing 2-0 defeat at Oldham, said: “Brad has been really unlucky not to play more. “We have a lot of midfielders who have been playing well, but I am sure he will play a part this season. “Brad has been in to see me to ask what he has to do to get into the side which I don’t mind at all. Captain Chris Forrester, Michael Bostwick, Leo Da Silva Lopes, Gwion Edwards, Marcus Maddison and Paul Taylor have all been preferred to Inman in recent matches. Posh have also taken West Ham United midfielder Martin Samuelsen on loan for the rest of the season. McCann is set to change his starting line-up for the visit of MK Dons to the ABAX Stadium for a League One fixture on Saturday (January 28).